Just got this program a couple of weeks ago. Wasn't sure if it was a Flames program or a Golden Seals program. Either way was fine, since I didn't have one from either team. The California Golden Seals were in their ninth year of existence in the National Hockey League. They were one of the "Class of '67" expansion franchises added to the NHL in 1967. The team played their home games at the Oakland-Alameda County Coliseum Arena, a 12,021-seat arena they shared with the NBA's Golden State Warriors. During their short existence in the NHL, the Seals were the definition of instability. The franchise changed ownership several times, including a brief stint being operated by the NHL. The team changed names multiple times as well, even partway through their inaugural season, switching from "Oakland Seals" to "California Seals" to try and draw fans from outside Oakland. The team's "Golden" era (in nickname only) occurred after Oakland A's owner Charlie O. Finley purchased the team. Attendance was a problem throughout the franchise's existence, never coming close to 10,000 per game. One of the reasons was that many San Francisco hockey fans were unwilling to drive across the Golden Gate Bridge to a game. The other reason likely was the performance of the team: In it's entire existence, the Golden Seals never finished above .500 and made the playoffs just twice. By 1975-76, the Seals had yet another new ownership group, led by San Francisco businessman Melvin Swig. General Manager Bill McCreary named Jack Evans, former head coach of the CHL's Salt Lake Golden Eagles, as the new head coach. In the previous two seasons, the Seals won only 32 games, including an ugly 19-48-13 record in 1974-75. Evans' first year with the club was an improvement, but not by much. California finished with a 27-42-11 record to retain last place in the Adams. Their 65 points were just four away from a franchise record, but 18 behind the third place Maple Leafs. The Golden Seals, while not total pushovers that year, were victims of a bizarre division alignment: they were joined by Toronto, Buffalo and Boston in the Adams. The Seals were stuck with easily the longest commutes for road games, which put them at a big disadvantage with their divisional rivals. California had the sixth-fewest goals in 1975-76, lighting the red light 250 times. The Golden Seals were led in goals and points by Al MacAdam, who had 32 goals and 63 points. Rookie Dennis Maruk, who would go on to a long career in the NHL, joined MacAdam in the 30-goal club, with an even 30. Three other players on that team scored at least 20 goals: Wayne Merrick, Bob Murdoch and Gary Sabourin. Another player of note was Charlie Simmer. Simmer was only in his second season in the NHL, but would eventually become part of the famed "Triple Crown Line" in Los Angeles a few years later, scoring 50 goals twice. In 1975-76, Simmer had just 1 goal in 21 games, spending the rest of the year in Salt Lake City. The Seals were about middle-of-the-pack on defense in '75-76. They allowed 278 goals that year, an improvement of 38 from '74-75. California actually had solid goaltending for most of their existence. Former Flint General Gilles Meloche, regarded as the classic "good goalie on a bad team", was in his fifth season with the team. Gilles played in 41 games, and while his 12-23-6 record wasn't anything special, he had a respectable 3.44 GAA and one shutout that year. He was joined in net by former Port Huron Flag Gary Simmons. Sporting his popular black mask with a cobra on the front, Simmons had a 15-19-5 record in 40 appearances, with a 3.33 GAA and 2 shutouts. Once again, no playoffs for the Golden Seals in 1975-76, the sixth straight year the team was on the outside looking in on the Stanley Cup Playoffs. Montreal would dethrone the Philadelphia Flyers in four straight to capture the Cup. This program is typical of the "GOAL" magazines of the time. It's a Seals program on the outside with an NHL magazine sandwiched in the middle. Combine the two sections, and the program is about 88 pages thick. Most of the GOAL pages are in color, while the Seals pages are mostly black-and-white. The usual articles are all there, including ones about the owner and the front office. Full-page articles about Ralph Klassen (3rd overall pick in 1975) and Rick Hampton are in the front of the program. The GOAL section features an interview with Flyers star Bobby Clarke, a recap of the 1974-75 New York Islanders, and linesman John D'Amico. 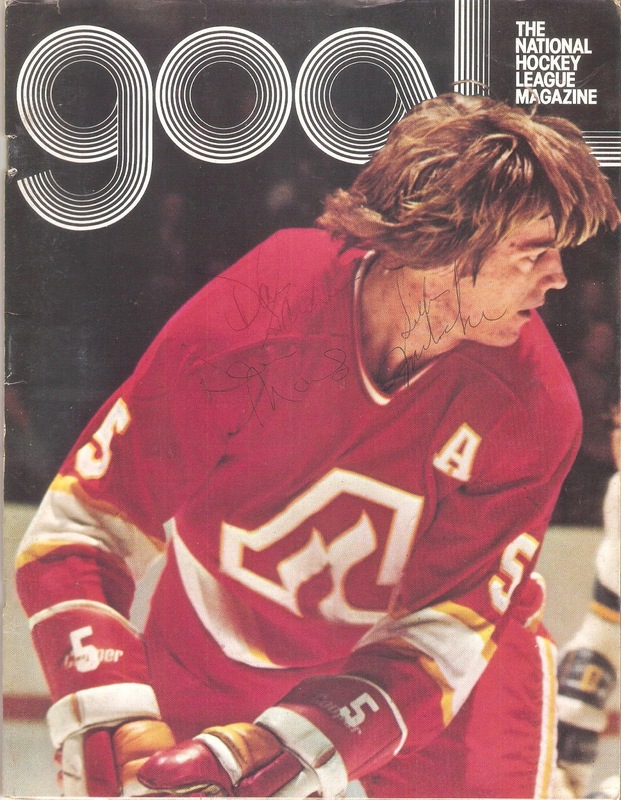 GOAL magazines tended to have a player from the visiting team on the front, hence the Flames' Curt Bennett. This game was played on November 30, 1975. Simmons was in net for the Seals, but the Flames won, 4-1, to hand California it's third loss in four games, dropping them to 9-16-2. Just 4,429 fans bothered to show up that night. Local ads include the Oakland Hilton Inn, Bridges Pontiac, Dreyer's Ice Cream and The Round Table pizzeria. This copy is autographed by three different players: Gilles Meloche, Dennis Maruk and Dave Gardner. Aftermath: Despite the last-place finish and league-worst attendance average, there were reasons for optimism in the Bay Area. The Seals had begun piling up young talent, such as Dennis Maruk, Charlie Simmer and Ralph Klassen, to go with a solid 1-2 punch in net. The team, after two straight horrific seasons, was actually in contention for a playoff berth for part of the season. Melvin Swig gave the Seals quality ownership, something that had been lacking for years. And while the attendance average was worst in the league, the 6,944 fans per game was a franchise record. Despite it's losing ways, the Seals had developed a die-hard, vocal core of fans during their stay in California. However, it all depended on the construction of a new arena in San Francisco, where the majority of the team's fans were located. When plans for a new rink were scuttled by civic leaders, Swig was convinced by partners George and Gordon Gund to relocate the Golden Seals to Cleveland, Ohio, for the 1976-77 season. The team was renamed "Cleveland Barons", in honor of the popular AHL franchise that existed until 1973. The Barons played in the state-of-the-art Richfield Coliseum, an 18,544-seat stadium with luxury boxes. However, it was located in the middle of nowhere off a rural two-lane road. Thanks to poor location and no time for advertising, the Barons flopped on and off the ice in their two-year history. They needed a cash loan from the NHL and NHLPA to avoid going out of business partway through year one. Swig got out after 1977, leaving the Gunds to operate the team. Despite an increase in funds to try and improve the team, the Barons attendance average dipped even lower in 1977-78, averaging just 5,676 per game. Seeing the writing on the wall, the NHL allowed the Gunds to merge the Barons with another floundering team, the Minnesota North Stars. The Stars would continue in the league, but take over the Barons' spot in the Adams Division. The Golden Seals/Barons franchise was the first NHL team to cease operations since the 1942 Brooklyn Americans, and the last in the four North American major leagues. The Bay Area returned to the NHL in 1991 with the arrival of the San Jose Sharks.